I wanted to share with you a tip I learned many years ago at a workshop by Louise Cutting. She uses Steam-a-Seam to hold certain areas in place. For instance, on the front button band, when you turn under the seam allowance, place 1/4" steam-a-seam under this seam. Then press in place. Now the front band stays in place and you can topstitch without any worries. I use Steam-A-Seam in the front band, collar band, cuffs, anywhere I want to hold the seam before I edgestitch or topstitch. Check out a tutorial at Louise Cutting's site to see more and photos to help explain. It is on a roll with a paper backing on one side. Steam a seam is my 'go to' notion for shirts and any sewing that depends on accuracy. I can never have enough of this notion. Your shirt is going to look real sharp. That's a great tip! Thanks for sharing! Also, my husband picked out that same flannel for a buttondown- funny! I just bought seam a seam for the first time. I can hardly wait to sew another shirt collar (never thought I'd say that)! Yes I just started using fuseable web to hold cuffs and hems in place and I am loving this little tip! I will certainly keep in mind to use it for blouse front bands. 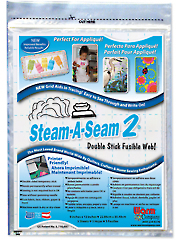 Steam is a great aid in sewing. Your archer shirt will look nice done with this fabric. I am amazed at how much you sew. I recently stated using steam a seam 2 for hems on knits. The hems top stitch easily without any puckering or rolling, and the garment has a better "finished" look. I believe this is the same as "wonder tape". I use it when we sew on zippers. No need to pin. Just use wonder tape and Voila! Perfect placement every time! Great tip, I love Steam-A-Seam! I mainly use it for sewing knit hems but will definitely start looking at it for more applications.